Building on the concept of our award-winning xMac mini Server for Mac® mini, we designed an expansion system that safely encloses the latest Mac Pro® into a tightly integrated 16" deep rackmount enclosure, incorporates PCIe card expansion with three PCIe 2.0 slots and 20Gbps Thunderbolt™ 2 technology, and provides the capability to add peripherals with optional Mobile Rack Device Mounting Kits. The new Mac Pro is an object of desire, but a lustrous finish hides its true beauty within—massive power. If you’re a pro user in the video or audio industries, the Mac Pro offers the power you need, but lacks the built-in expandability you count on. In order to achieve this engineering feat, Apple® designers stripped away components and space to a minimum, taking out PCIe slots and drive bays, and packed the remaining components into a small cylinder. 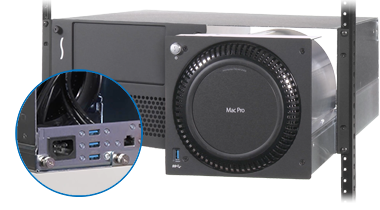 Its compact size makes the new Mac Pro more transportable and rackable, but prevents onboard installation of PCIe expansion cards. In addition, the computer still requires an enclosure to make it road- or rack-ready and provide convenient cable management. 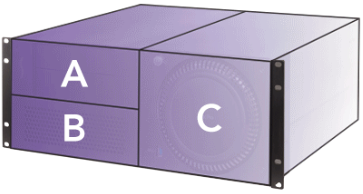 xMac Pro Server houses the computer, a PCIe cards expansion module, and optional mobile rack kit equipment in a modular, rugged 4U steel enclosure. 20Gbps Thunderbolt 2 Technology and optical or copper Thunderbolt cables ensure maximum performance. Sonnet's Mobile Rack Device Mounting Kits enable you to add more expansion devices to your rack without taking up additional rack space. The Mobile Rack Device Mounting Kit includes an internal 100W power supply inside to power the installed devices, a large internal fan to quietly and efficiently cool the expansion kit, and mounting hardware to secure the devices and the kit itself. 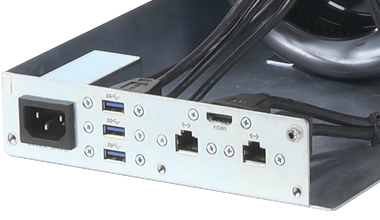 Preconfigured kits include the mobile rack peripherals, PCIe card, and necessary cables; you provide drives as necessary. 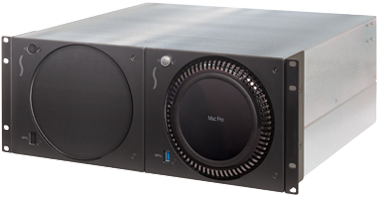 If you like the idea and design of the xMac Pro Server, but don’t need the expansion capabilities it offers for your Mac Pro, consider Sonnet’s RackMac™ Pro rackmount enclosure for one or two Mac Pro computers. This 4U enclosure includes one or two Computer Mounting Modules (the same included with the xMac Pro) to secure the computers, and supports the installation of one Twin 10G Dual-Port 10 Gigabit Ethernet Thunderbolt 2 Adapter per computer. If you change your mind later about Thunderbolt-to-PCIe card expansion, you can add one or two Sonnet Echo Express III-R chassis to your setup. xMac Pro servers are shown for illustration purposes; items sold separately.